The secret ingredient in whipping up the perfect French chocolate mousse recipe is in the chocolate. High-quality rich, dark chocolate is the gourmet choice for French chocolate mousse. 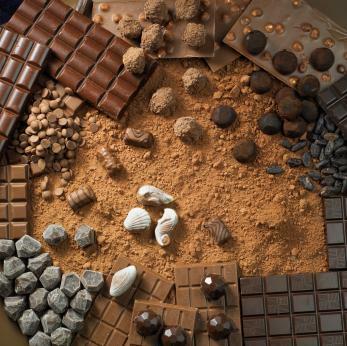 The higher the percentage of cocoa solids listed in the chocolate constituents, the better. The key to creating a chocolate mousse masterpiece is in the simplicity of the classic French recipe, where less is more. Only use the finest ingredients, such as dark chocolate, liqueur and pure butter. Purchase fresh eggs and butter, and relish in the rich flavor of your light and airy chocolate creation. A gourmet French mousse recipe that will appeal to those with a sophisticated palate for the finer things in life. Melt the chocolate, butter and coffee in a double boiler over a slow simmer until smooth. Remove from heat and cool just slightly. Separate the egg yolks and whites into two clean bowls. Whip the egg whites with salt until frothy, add the cream of tartar (optional) and beat until stiff peaks are nearly formed. Use either an electric mixer or mix by hand. Alternatively, add in a tablespoon of sugar and beat until the whites hold their own shape. Add the remaining sugar (optional), liqueur and egg yolks to the warm chocolate base, and beat until thick and smooth. Gently stir one-third of the egg white mixture into the chocolate base. Fold in the remaining egg whites delicately to retain their shape and volume within the mousse. Transfer mousse into fancy dessert glasses and chill for at least six hours. Once the mousse is firm, serve French chocolate mousse as it is. Alternatively, serve gourmet mousse with whipped cream and fresh chocolate shavings, or with the garnish of your choice. Sometimes the most elegant recipes are those with the simplest ingredients. This stands true with a classic French chocolate mousse recipe, where less is more. Dark chocolate is one of those tastefully simple gourmet foods. Melt the dark chocolate pieces and butter (optional) in a double boiler over a slow simmer until rich and smooth. Remove from heat and cool just slightly. Separate the egg yolks and whites into separate clean bowls. Whip the egg whites with salt until frothy with either an electric mixer or by hand. Add in a tablespoon of sugar and beat until the egg whites peak and hold their shape. Add the remaining two tablespoons of sugar (optional) and egg yolks to the warm chocolate base, and beat until thick and smooth. Gingerly fold the egg white mixture into the chocolate base in order to retain the shape and volume of the mousse. Transfer mousse into dessert cups and chill for at least six hours. 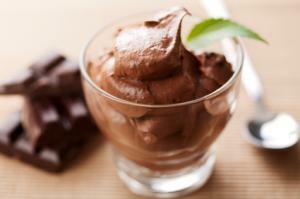 Once the mousse is firm, serve French chocolate mousse as it is, or with an elegant garnish of your choice. A French chocolate mousse recipe prepared perfectly is elegant in its tasteful simplicity. Just the same, the presentation of a gourmet recipe is an art of its own. Finding new ways to serve gourmet mousse is inventive; experiment with champagne glasses, espresso cups or wherever your imagination leads you. Simply garnishing a chocolate mousse with whipped cream and shaved chocolate is a tried and true favorite. Even so, if you want to get creative there are many ideas to choose from. Crushed cookies, such as Oreo cookies, caramelized nuts and candied fruit are all delicious accompaniments. For a more health conscious approach, try experimenting with fresh fruit and berries, such as raspberries, and top them off with raw nuts, such as pistachios. Use caution when consuming raw eggs. There is always a risk of Salmonella or other food-borne illness while consuming raw products. Use only the freshest top grade eggs to reduce the risk of food-borne illness. If you have concerns about raw eggs, another alternative for mousse recipes requiring raw eggs is to use pasteurized eggs suitable for whipping into a solid volume.